There’s been a lot of controversy over TransCanada’s Keystone XL pipeline. But there’s another company working to bring more tar sands oil into the U.S.
Enbridge Energy wants to increase the amount of heavy crude oil crossing the border from the Alberta tar sands into the Great Lakes region. 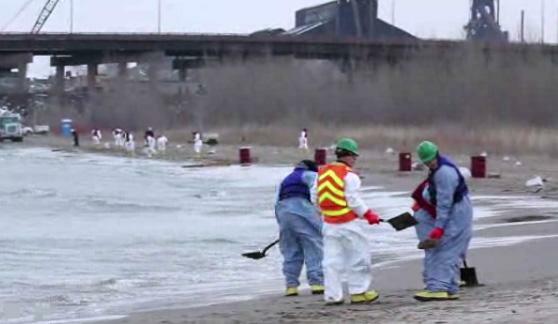 Cleanup of the 2010 Enbridge oil spill. The company wants to bring more tar sands oil from the Alberta oil sands region into the U.S.
Lorraine Little is with Enbridge. She says Enbridge wants to move more oil on its pipeline known as the Alberta Clipper. That pipeline runs about a thousand miles from northern Alberta to Superior, Wisconsin. “Its purpose is to carry heavy crude oil from the oil sands in Alberta into our Superior terminal where then it can get off on other pipelines and serve refining markets around the Midwest region or other parts of the country,” she says. Back in November of 2012, Enbridge filed an application with the U.S. State Department. The company wants to raise the capacity of the border segment of the Alberta Clipper pipeline to 800,000 barrels per day (they're currently transporting 450,000 barrels per day). That permit is still under review. But in the meantime, before the permit is issued, Enbridge has found another way to get that oil into the U.S. Since they can’t bring the oil across in the Alberta Clipper, they’re working to bring it across in another line, Line 3. Little says Line 3 doesn’t have a capacity limit in its permit. Once it’s across the border, that oil will be moved back to the Alberta Clipper. Shifting the oil between these pipelines will allow Enbridge to get to its 800,000 barrel a day target. “We’ve talked with the Department of State about that work; they’ve been fully briefed on those plans, and they’ve confirmed that work doesn’t require any federal approvals because those pipelines already have permits in place,” Little says. She stresses that these pipeline connections are a temporary solution, and that Enbridge is continuing to work with the State Department toward the presidential permit. But some environmental groups are outraged about Enbridge’s plan to connect the pipelines. “Basically, they’re doing a little end run around the border to try to get past a permitting limit,” says Jim Murphy, senior counsel for the National Wildlife Federation. Murphy says his group might file a lawsuit if the decision isn’t reversed. The State Department did not want to be interviewed for this story. But in an email, a spokesperson says the State Department has no role in approving changes in pipeline facilities outside the border segment of a pipeline. 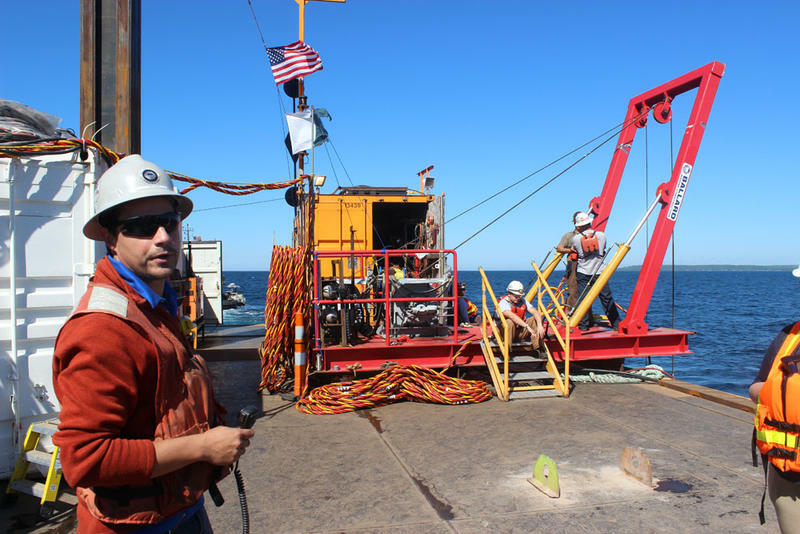 Over the last month, Enbridge has been working to secure their two 20-inch pipelines to the lake bottom, and weather permitting, officials say they should finish their work over the next few days. Enbridge’s Line 5 pipeline runs 645 miles from Superior, Wisconsin to Sarnia, Ontario. At the Straits, the single 30-inch pipeline splits into two 20-inch pipelines. Enbridge says Line 5 carries natural gas liquids and light crude oils. They say it does not carry the heavy dilbit crude that proved so difficult to clean up in the Kalamazoo River oil spill. We've just marked the 25th anniversary of one of the most catastrophic man-made environmental disasters, the Exxon Valdez oil spill. It was just after midnight on March 24, 1989 when the Exxon Valdez struck a reef in Prince William Sound. 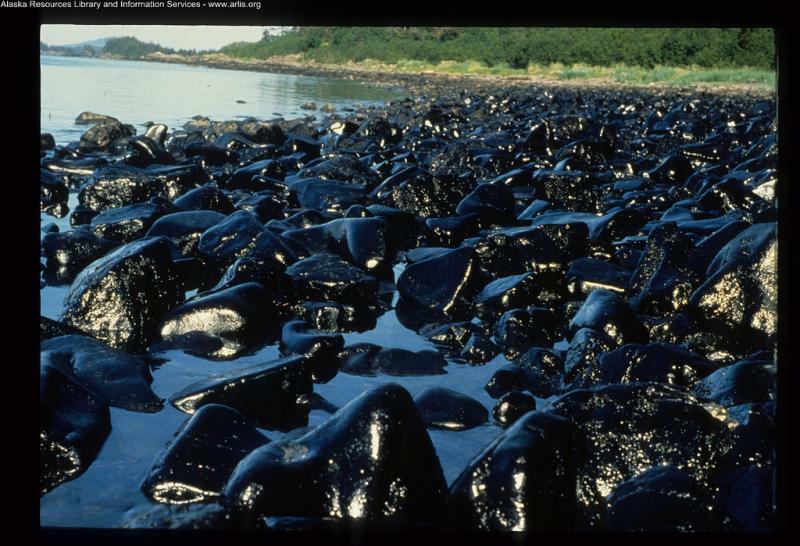 11 million gallons of crude oil gushed into the pristine waters. The clean-up effort was staggering. Among those called to help was U.S. Coast Guard Lt. Commander Thomas Haas. He was a chemist and an expert in hazmat cleanup. Twenty-five years later, that Lt. Commander is the president of Grand Valley State University. “We had to figure out what clean meant,” Haas said. This post was updated as we waited for an estimate on how much oil spilled into Lake Michigan from the BP refinery in Whiting, Indiana. Now that an estimate has been released, we'll continue to follow this story in other posts. Update: Thursday, March 27, 4:39 p.m.
BP has revised its estimate of how much oil spilled Monday. It now says 15-39 barrels leaked from the Whiting Refinery. That's about 630-1,638 gallons. Petty Officer Jeremy Thomas is with the U.S. Coast Guard’s Marine Safety unit in Chicago. He says a small crew has been removing the oil manually. He says the cleanup efforts are going well. “That involves either a gloved hand or a shovel or rake or some sort of hand powered tool to remove the oil from the shoreline,” Thomas said. Thomas says federal agencies are waiting for weather conditions to improve before assessing if there’s any heavy tar sands oil on the lake bottom. “There’s nothing that leads us to believe that there’s any down there but we want to rule it out because of course we want to make sure the environment’s safe and healthy and clean,” Thomas said. It’s not clear what exactly caused the spill or how long cleanup will take. Update: Tuesday, March 26, 7:21 p.m.
Crews have recovered the vast majority of oil that had been visible on the surface of a cove-like area of Lake Michigan and on the shoreline between the refinery and a nearby steel mill. 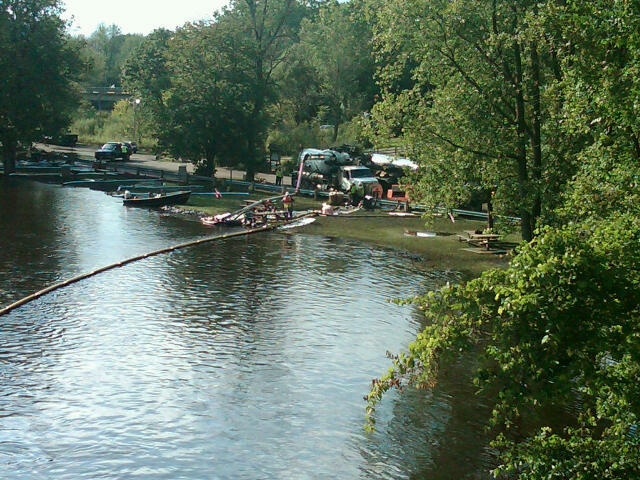 They have used vacuum trucks and absorbent boom to contain and clean up the surface oil. Responders also manually collected oil that had reached the shore. Monitoring continues in coordination with the U.S. Coast Guard, EPA and the Indiana Department of Environmental Management. Update: Tuesday, March 26, 4:37 p.m.
Michigan Radio's Cynthia Canty spoke with Chicago Tribune environmental reporter Michael Hawthorne this afternoon about the spill. You can listen to the full interview here. Hawthorne told us about the history of the Whiting refinery. It's one of the oldest refineries in the country. "We don't know yet just how much oil was released from the refinery into Lake Michigan a couple of days ago. Some people were suggesting, at least off the record from the company, were suggesting that it was about 10 barrels - 12 barrels, not a lot in relative terms," said Hawthorne. "And given the amount of pollution that's already going into the lake from that part of northwest Indiana, how much affect it had on the lake, at least in the eyes of environmental regulators is fairly minimal." Will Enbridge Energy's new pipeline in Michigan be safer? A new oil pipeline is going underground in Michigan. An interview with Michael Hawthorne, a reporter with The Chicago Tribune. 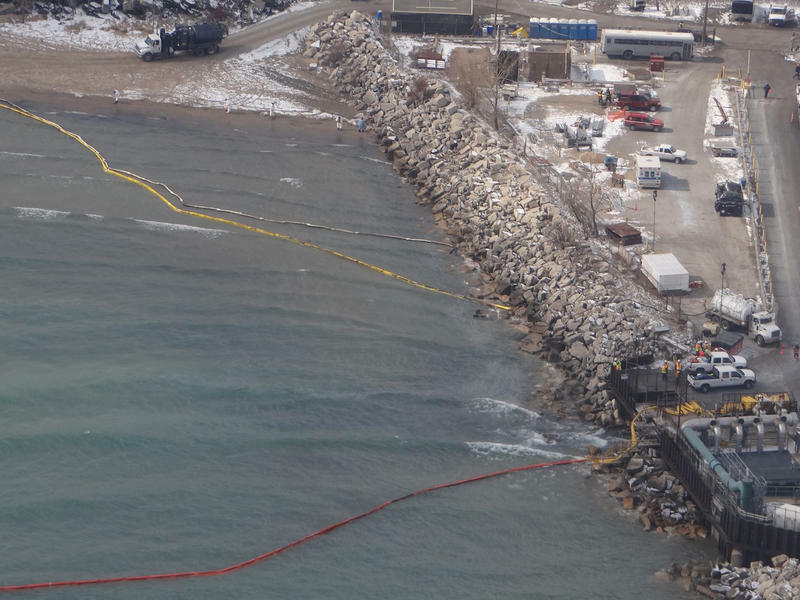 An oil spill from a BP refinery in Whiting, Ind., this week has raised new worries about the stepped-up processing of Canadian tar sands – and threats to Lake Michigan. Considering that seven million people in Chicagoland depend on Lake Michigan for drinking water, even a little spill might be cause for concern. Exactly what was spilled? How far did it spread? And has BP contained the leak? We're joined now by Michael Hawthorne, a reporter with The Chicago Tribune.